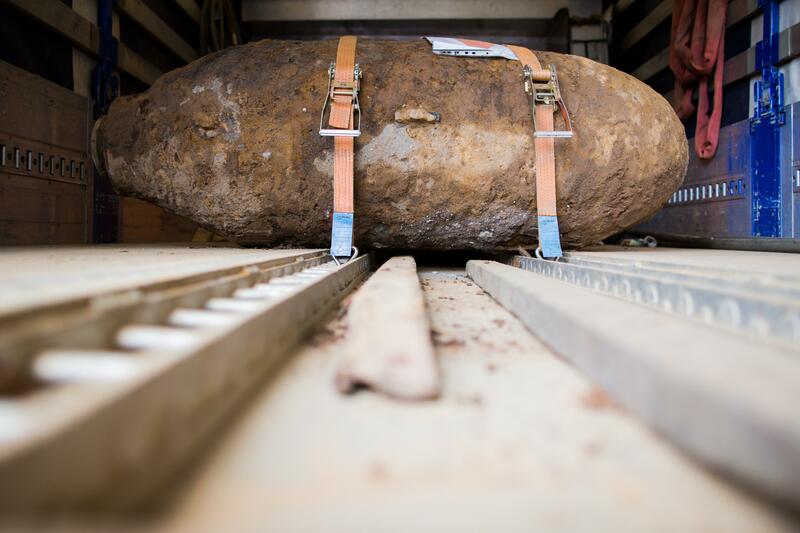 WWII bomb, Cologne, Germany: Evacuation follows discovery. The bomb rests in a truck bed after being disarmed in Cologne. Some 20,000 residents in Cologne, Germany, were briefly evacuated Wednesday from a 1-kilometer radius around a 1-ton unexploded World War II-era bomb that was discovered 5 meters underground by construction workers. The bomb is thought to be of American design, the BBC reports, and it was safely defused. This is the sixth year running that an unexploded bomb has been unearthed in Germany; in 2010 and 2015, the bombs exploded and caused fatal injuries. Cologne was the site of heavy Allied bombing during the war. Atlas Obscura points to a 1992 International Herald Tribune article noting that the city was targeted by a staggering 1,046 British bombers on a single night in 1942, in the first raid conducted by more than 1,000 bombers. In October 1944 a United States Air Force mission against Cologne involved 1,338 bombers and 811 fighters.